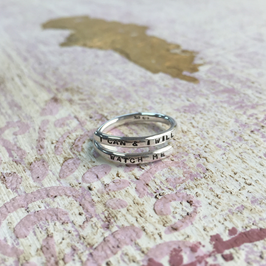 These adjustable crossover silver lyric rings are made to measure with a message of your choice. If you are looking for a gift and you're not completely sure what finger size you need, then these work really well! You can fit approx 25 characters on the outside of the ring or on the inside if you prefer. This ring says "I can and i will, watch me"
Just specify what you would like in the notes section when you check out. These are 2.5 mm wide x 1.7 mm thick court shape rings which makes them nice and comfy to wear.